This month I’m taking a look back at the market over the past 10 years. 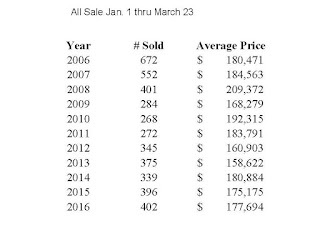 The chart below shows a comparison by year of the # of properties sold and their average sales price for the time frame of January 1 through March 23 of each year. Data was collected from the Lake of the Ozarks Multiple Listing System. As you can see, the number of sales peaked in 2008, falling to a low in 2013, and now steadily gaining momentum over the last three years. The past two years have shown a significant increase in closed properties. 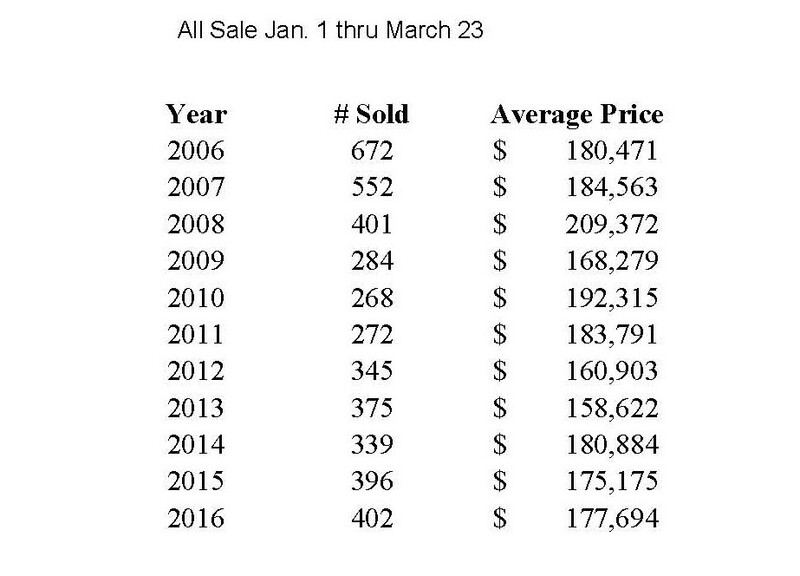 The average sales price rose in 2010 and 2011 then fell again in 2012 & 2013. In reviewing the individual sales, this is due to a few higher end sales during those periods which caused a higher average sales price rather than an actual boost then decline in property values. The National Association of Realtors reported that existing home sales dropped 7.1 percent to a seasonally adjusted annual rate of 5.08 million in February from 5.47 million in January. Despite last month's large decline, sales are still 2.2 percent higher than a year ago. Lawrence Yun, NAR chief economist, says existing sales disappointed in February and failed to keep pace with what had been a strong start to the year. "Sales took a considerable step back in most of the country last month, and especially in the Northeast and Midwest," he said. "The lull in contract signings in January from the large East Coast blizzard, along with the slump in the stock market, may have played a role in February's lack of closings. However, the main issue continues to be a supply and affordability problem. Finding the right property at an affordable price is burdening many potential buyers." The median existing-home price for all housing types in February was $210,800, up 4.4 percent from February 2015 ($201,900). February's price increase marks the 48th consecutive month of year-over-year gains.